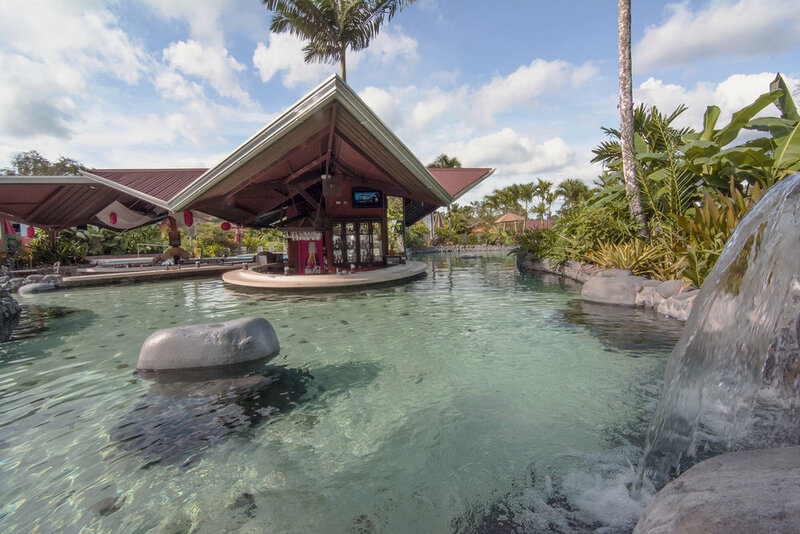 The Arenal Springs Hotel hot springs have been created to give you the feeling that you are in natural thermal river in the middle of the rainforest. Tropical gardens surround the river to add to the sensation. The floor of the pools is made from limestone which adds to the soothing atmosphere. The pools range in temperature from 34-40°C (93-104° F) with a pH of 6.7. Our primary restaurant was named for the Maleku Indian word for River or Spring. In this cheerfully decorated, high ceiling, open air restaurant you will enjoy a huge breakfast sure to please everyone in the crowd. Here you will find Costa Rican traditional dishes like Gallo Pinto, Carne en Salsa (Shredded beef), fried plantains, and tortillas, in addition to American classics like pancakes, waffles, and hash browns. There is an egg station where you can order your egg or omelet just the way you want it and watch as it is prepared for you. There is a bread station complete with a toaster, butter and jellies, in addition to several homemade breads made fresh each morning. In the cold station you will find a variety of cereals, milk, yogurt, fresh tropical fruit, and 2 flavors of juice. Our attentive wait staff will also be ready to offer you fresh Costa Rican coffee or the hot tea of your choice.